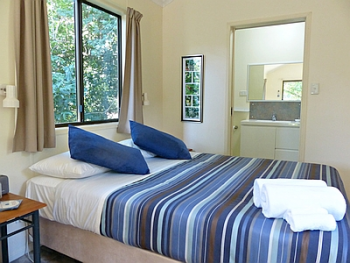 The bungalows have an airy open-plan layout, air-conditioning, ceiling fan and full insect-screening. There is a kitchenette with cooktop, microwave, fridge and all cooking utensils, timber dining setting and comfortable lounge area. The ensuite bathroom has a large shower, guest amenities and luxury bamboo-cotton towels. A complimentary breakfast basket is delivered each afternoon to each bungalow - next morning you may enjoy "breakfast with the birds" on your private verandah! A private verandah overlooks the wetlands-dam and rainforest and the bungalows are surrounded by lush tropical gardens, a haven for birds, butterflies and wildlife. These two bungalows, while very private, are reasonably close to each other and are ideal for guests who are travelling together. 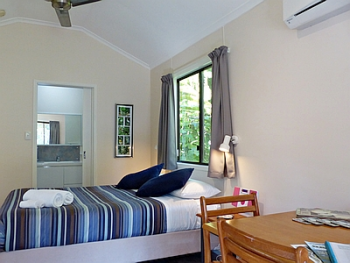 The bungalow has an airy open-plan layout, air-conditioning, ceiling fan and full insect-screening. There is a kitchenette with cooktop, microwave, fridge and all cooking utensils, timber dining setting and comfortable lounge area. The ensuite bathroom has a large shower, guest amenities and luxury bamboo-cotton towels. Sunbird Sanctuary is the closest bungalow to The Shed with it's BBQ, Jacuzzi, books, board games, dartboard and access to complimentary Wifi. Payment: No deposit required. Visa or Mastercard details required only to confirm booking (this is a secure site). Cash is also accepted.